Wine walks, art tours, chocolate crawls – these are all events that can help get customers to visit a number of stores in an area. Shoppers buy a ticket or are given a passport and a list of participating businesses, and make their way from one venue to the next. 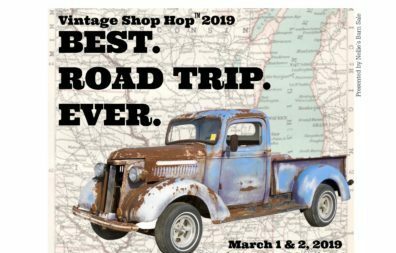 The Vintage Shop Hop takes this idea to a much larger scale, including over 450 retailers in a two-state area in a self-guided tour of vintage stores, antique malls and women’s boutiques during the first weekend in March. The two-day event, which is free to customers, invites people to get together with friends and hit the road to visit the many participating vintage shops in northern Illinois and southern Wisconsin. The stores each pay a $50 fee, and must agree to the hours of the event and to meeting requirements for giveaways and participation. Many offer discounts, gifts with purchase, raffle drawings, demos and refreshments, and in some areas participating shops promote together to get customers to visit them all. The Vintage Shop Hop has its own Facebook page with over 25,000 followers, and provides a master list and an interactive Google map for shoppers to use. Participating stores are provided with many social media tools so that they can promote the event to their own followers as well. “The idea was simply to give the shopper a reason to call their friends and spend the day shopping for vintage decor in their own backyard,” says Campos. “I wanted to make it easy for them to travel from shop to shop while supporting small business at the same time,” she said. She describes the event as a road trip on steroids and goes on to say that the hardest part for shoppers is deciding on which area to travel to for their road trip fun. This is a great idea that could work for other types of stores, or in other areas. Kudos to Ann Campos for her efforts to support independent retailers in the midwest!